It's interesting to watch a master taking on a large number of opponents simultaneously. That is probably the only occasion when an average player can hope to beat a far stronger rival. Playing against so many players at a time is not easy. The master has to move from one board to another and make his moves very quickly. Nevertheless, grandmasters have an exceptionally good score in simultaneous shows. Things may turn out to be very different when the master is playing blindfold! Imagine how he can manage to keep the latest positions over all the boards in his mind. Diabolical memory? 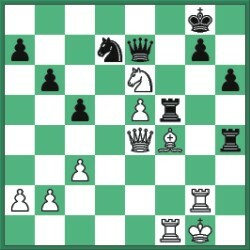 Yes, it is really difficult to calculate moves when you don't see anything. Masters have played blindfold games that ordinary mortals cannot produce even when everything is in sight. Serious chess players can play without the board. But that is an encounter between only two players and the game usually is fraught with mistakes. The blindfold experts, on the other hand, are known for their ability to play almost as good as they do when their eyes are open. Alexander Alekhine played a brilliant blindfold game at a military hospital during the First World War. He was known for his exploits as a blindfold player. Then there were players like the Belgian master George Koltanosky and the Hungarian blindfold wizard Fleisch who could play over 60 blindfold games at a time. The figure is a bit mind-boggling. Playing blindfold is considered to be a difficult art in which only super-humans can excel. The exercise obviously puts pressure on the player as he has to make some special efforts to retain the positions in his memory. As chess has become a totally professional game, such gimmicks and weird ideas have lost appeal. Players at the top level are concerned mainly with the hefty prize money that big tournaments offer. They have to prepare themselves constantly for the major events. So the masters today have little time to entertain the spectators with chess magic. However, the art is not lost altogether. The American prodigy, Harry Nelson Pillsbury, was known for his great prowess in blindfold games. Here is a game played by him.